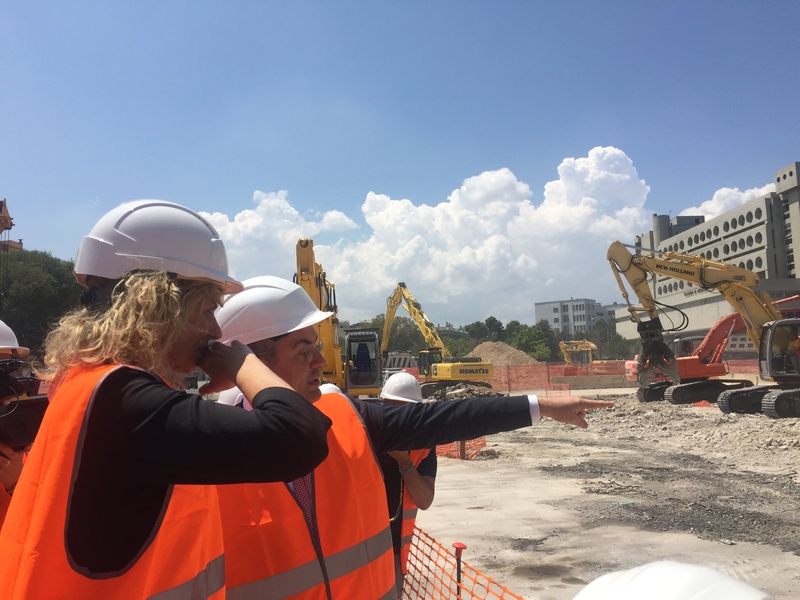 “At last something is going faster”, the Minister for South Barbara Lezzi has said, visiting the yard of FAL of the new station of Matera centrale accompanied by President Matteo Colamussi. The Minister has shown her satisfaction for the progress of works and President Colamussi has explained: “We have started just 20 days ago and we have already done a good deal of work: we have demolished the old building, now we are eliminating the pedestrian crossings, we are going on at a very high rhythm. Our only enemy is bureaucracy, but we are in time and we want to demonstrate that also in the South of Italy there is a ruling class able to respect times and the engagement to give Matera an important station”. The new FAL station of Matera centrale will be a public space usable by citizens and travellers, with a big external shelter with iridescent lights and green cut. A big opening will be realized in the attic of the old station, allowing aeration and lighting. The work, funded with 7 million euros under PO FESR 2014-2020, will be realized in two steps with accessibility ensured by December 2018 and end of works scheduled by May 19.